This tip isn't the most obvious for lots of Google AdWords users so I thought I would pass it on as it could a) save you money, b) get you an improved CTR and c) get an improved conversion rate. Let me start my saying that most new AdWords users start off with a single bidding strategy for AdWords and that strategy pretty much stays with them forever, it’s a good strategy, it’s easy to measure and it does bring with it some success, but it’s flawed! As a reminder, here the Adwords (Sponsored) ads are highlighted in red; I've also highlighted in red the ad position number. This strategy that new AdWords users deploy is that they want position 1, it’s the highest position and is therefore the best position to be in right! 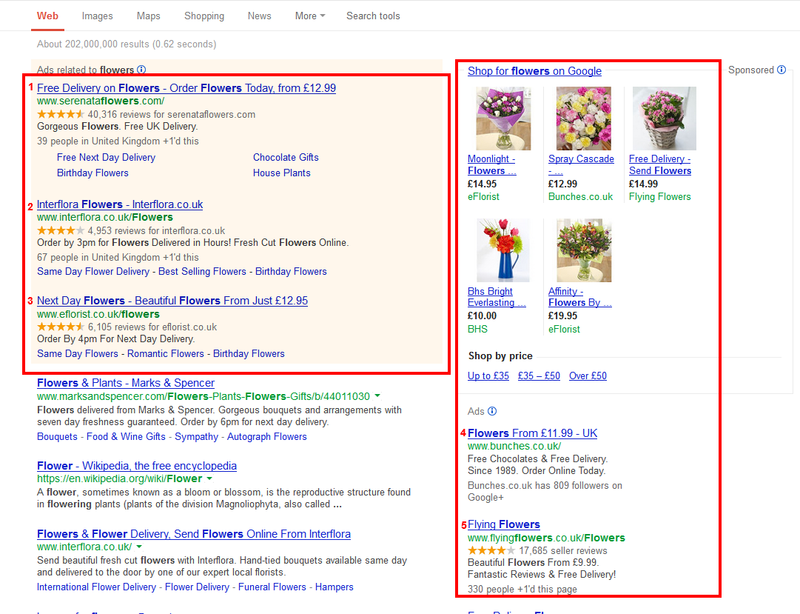 It’s the topmost position, so will be seen first as users scan the search engine results, it must be a winning strategy! Wrong (well sometimes it’s the wrong strategy to adopt). A general rule of thumb and the one that should sound alarm bells is that the users of Google have become blind to the top ads, rather like we all have with banner ads (the ad images that appear at the top of web pages), we all tend to ignore those now. What you need to do is look at your AdWords stats to determine which ad position you tend to get the most clicks and again as a rule of thumb the lower the average position the cheaper your clicks will be. Take my latest gig as an example, we were paying more and more for top position ads and we got into a price war with our competitors, so it was getting expensive; no-one really knew what ad position was best for us, but a quick analysis showed that we got more clicks and an improved conversion rate when our ad was around position 3. Armed with this little bit of knowledge I did a simple test, I reduced the Max CPC bids where we had an average position better than 3 and increased the Max CPC where we were below position 3. (The plan was to bid for position 3 in all case). These reduction in bid strategy meant that our ad was less likely to be shown; but where the ad was shown we would be closer to the natural search links, therefore be seen as more relevant, hopefully resulting in an improved CTR and conversion rate. In just two weeks impressions dropped 18%, clicks dropped 15%, but CTR went up 5% and conversions increased a whopping 17%. I’m now paying 30% less for AdWords here but gaining on my better conversions. 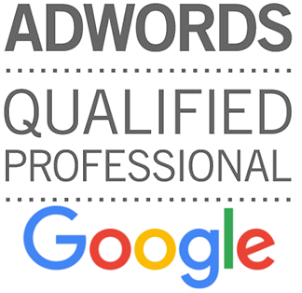 Don’t get me wrong, years ago when I started using Google AdWords I bid for the position 1 and did everything in my power to maintain it, it worked for me, it brought in business, but little did I know that I could have reduced my costs and brought in more business! Remember, calculate where you best ad position is and bid for this ideal position, which isn't always the top one! What can your website learn from Social Media?